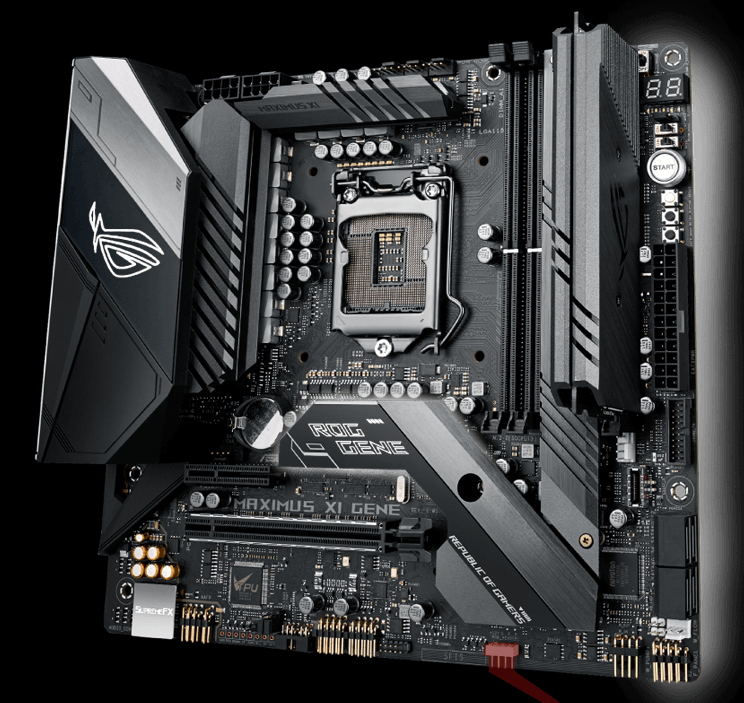 Within tradition the ROG overclocking series continues with Z390 as well . 1. LN2 wise the benching experience with additional voltages is quite same, RSVD switch works most of time for solving CBB issues, some cpu's can scale with up to 1.85V PLL Termination . Typically new cpu's scale up to 1.8V for multi-thread and 1.95+ for single-threaded benchmarks. 3. 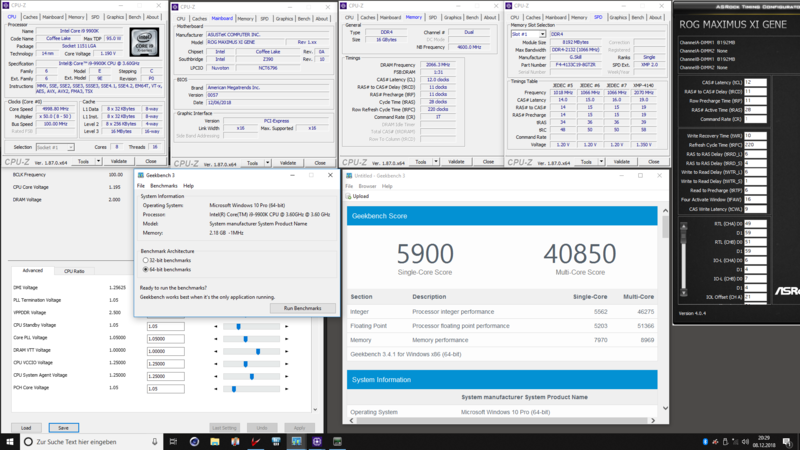 Cofee Lake refresh has a little bit different IMC compared to regular Cofee Lake, meaning you might need to sort your oc-dimms again and also some dimm's are simply not liked by the new IMC. A value of 0.95 vttdram helped few kits in my case but ymmv. 4. Make sure you use a strong PSU otherwise you might run into issue and experience shutdown in heavy-load benchmarks. 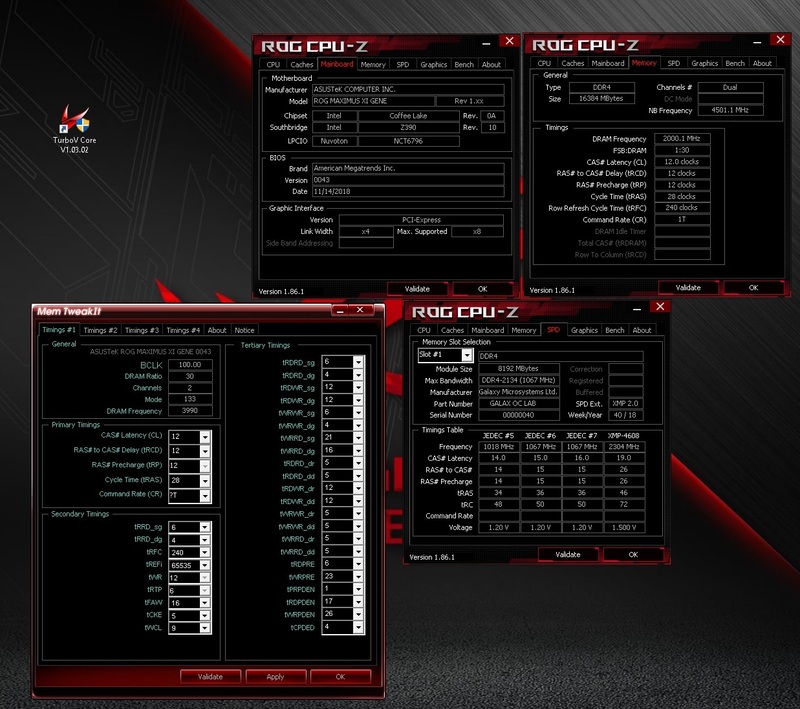 While using heater and hard benchmarks it is best to use heatspreader on VRM. Lovely. Fix for a board I'll never get my hands on without spending copious amounts of $$$ to import. But hey websmile, that tip for the MOCF is working nicely! On topic, is the slow boot only fixed for 9x00 or also for 8x00 on the gene XI, is this tested? how about win xp ? 😛 on z390 dark there is a way to get it working. Thx for share Alex, keep up the good work! Has anybody got results with tight timings with a2 mem using this board yet? This was good to go at first try, 4133 could train but cannot enter os, the kit i used was not of best quality though. Crazy how high binned B-die kits doesn't guarantee extreme OC ability. I have a lowly set of Trident Z RGB 3600C17 that will happily boot into Windows XP 4133 12-11-11-28 1T, but a kit of Team T-Force Xtreem 4500 wouldn't. @sabishiihito I'm really curious about that RGB kit. Do you have screenshots? 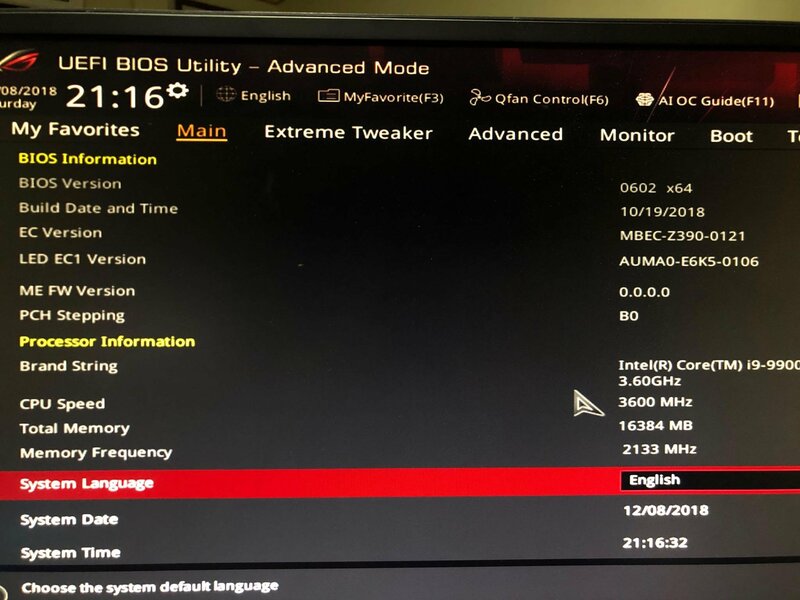 @Alex@ro Is there a change log for this latest Bios 0057 ? I'm on Bios 0044 on my Gene right now. thank you for the quick updates. Hi, there are some possibilities of bioses with improved a2 pcb oc for m9a/mxa ? Quick check with 0057 BIOS and random RGB sticks, RTL Auto. 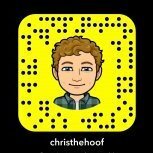 Is there a way to get around 2V limit without LN2 mode (consequently giving the CPU LN2 volts when pushing safe boot)? i try flash other bios same ME Fail you have Tool for flash ME ? Thank you Alex , i will give it a subsero run today with a new random 9900k to see how it behaves. I have a Max XI hero Z390 and compared to my Gene XI Z390 it's a huge difference in sustained loads / voltages / stability / Ram overclocking , Max XI hero it's not suitable for high overclocks mostly the voltage drop and droop it's huge and very unstable on the hero while the Gene does not blink voltage wise and 100% stable on sustaining very high voltages with only llc at 7. Try the usb flashback option and go back to Bios 0057 as it is the latest Bios dated 12/06/2018 while the Bios you are flashing 0602 is older dated 10/19/2018 to see if this fix your problem , pull the battery out and let it drain all power for at least 15~30 minutes and re-try flashing again. Here is a screen shot of my Gene XI on latest Bios 0057 dated 12/06/2018 and the ME is version 12.0.6.1120 , no problems so far but i have not try going to older Bios. @aerotracks Very nice rgb kit.